Monica Maschak - mmaschak@shawmedia.com Five-month-old Dexter, a potbelly and juliana mix, visits a Locust Elementary School classroom for Farm Day on Friday, February 22, 2013. Students spent the day learning about a shrinking culture of farming with field trips to local farms and fun farm activities. 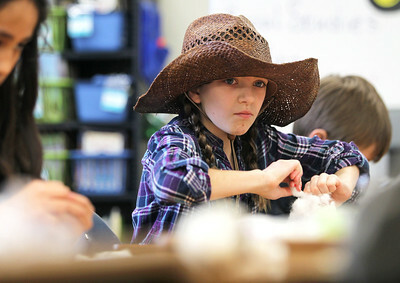 Monica Maschak - mmaschak@shawmedia.com Jenna Turner and her fourth grade classmates practice separating cotton from its seeds to simulate how cotton used to be picked during Locust Elementary School's Farm Day on Friday, February 22, 2013. Students spent the day learning about farming with field trips to local farms and fun farm activities. 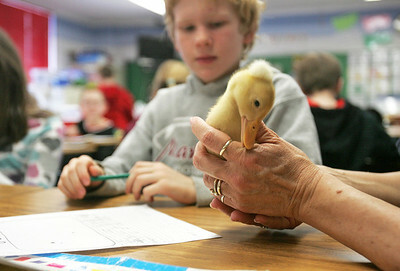 Monica Maschak - mmaschak@shawmedia.com Second grader Logan Miller looks at a little duckling that was brought in to the classroom for Farm Day at Locust School on Friday, February 22, 2013. Students spent the day learning about the shrinking culture of farming with field trips to local farms and fun farm activities. Monica Maschak - mmaschak@shawmedia.com Reginaldo Rivera (right) shows off the pig cookie he made as his third-grade classmate Michael Macias eats his own creation during Farm Day at Locust Elementary School on Friday, February 22, 2013. Students spent the day learning about the shrinking culture of farming with field trips to local farms and fun farm activities. Monica Maschak - mmaschak@shawmedia.com Second grader Araceli Popoca-Leuth pets a duckling that was brought into the classroom at Locust Elementary School during Farm Day on Friday, February 22, 2013. Students spent the day learning about the shrinking culture of farming with field trips to local farms and fun farm activities. Monica Maschak - mmaschak@shawmedia.com Fourth graders practice separating cotton from the seeds to simulate the old days of cotton picking during Farm Day at Locust Elementary School on Friday, February 22, 2013. Students spent the day learning about the shrinking culture of farming with field trips to local farms and fun farm activities. 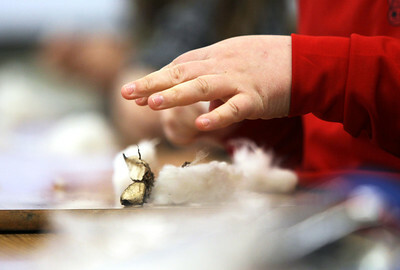 Monica Maschak - mmaschak@shawmedia.com Kindergartener Nathan Sowa plays with a feather while he makes a chicken craft at Locust Elementary School on Friday, February 22, 2013. Students spent the day learning about a shrinking culture of farming with field trips to local farms and fun farm activities. 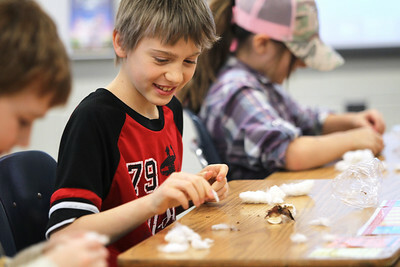 Monica Maschak - mmaschak@shawmedia.com Justin Bounds and his fourth-grade classmates practice separating cotton from the seeds to simulate the old days of cotton picking during Farm Day at Locust Elementary School on Friday, February 22, 2013. Students spent the day learning about the shrinking culture of farming with field trips to local farms and fun farm activities. 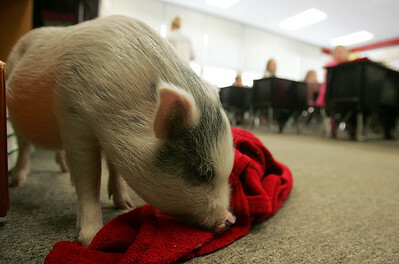 Five-month-old Dexter, a potbelly and juliana mix, visits a Locust Elementary School classroom for Farm Day on Friday, February 22, 2013. Students spent the day learning about a shrinking culture of farming with field trips to local farms and fun farm activities.